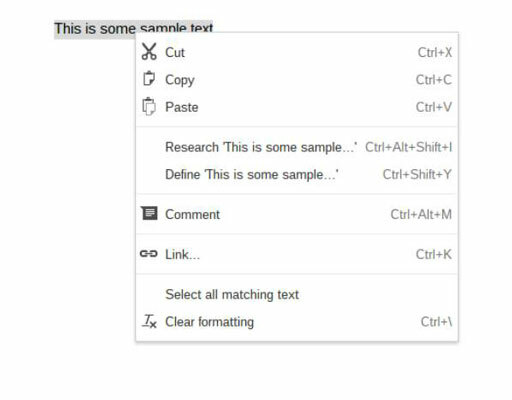 As you create documents on your Chromebook, you can avoid typing out repetitive text by using the Copy and Paste functions. Copying and pasting can be done in several ways — on the keyboard, with the touchpad, and so on. Larger documents that contain several thousand words over numerous pages may be too large to effectively navigate with just your keyboard. Your touchpad will come in handy with these documents because you can quickly locate, select, copy, and paste text. Using your touchpad, move your cursor to the text you want to copy. Place two fingers on your touchpad and swipe up or down to scroll to a different page within your document. Place one finger on the scroll bar and move your pointer to the vertical scroll bar located on the right side of the screen. Click anywhere on the bar to quickly scroll to a different page. Or, on the bar itself, click and drag your cursor up or down to scroll to different pages. Click and drag your cursor over the section of text you wish to copy. When all the text is selected, release the click. A highlighter follows your pointer as you drag it across the text. You can select text using the keyboard by using the arrow keys while holding the Shift key. Go character by character by using the left or right arrow keys. Select entire lines by using the up and right arrow keys at the same time. In the Applications menu, click Edit→Copy. Alternatively, press and hold the Alt key and click on the highlighted text. A pop up menu appears in which you can choose Copy, as shown in this figure. The selected text is copied to your Clipboard. Using your touchpad, scroll to the location where you would like to place your text and click to place your cursor. Open the Edit menu again and select Paste. The copied text will be pasted into the document at the location of your cursor. You can paste the contents of your Clipboard as many times as you like. If you need to place the text in numerous locations, simply move to each location and paste the text by following Steps 4 and 5 in the preceding list.